Tags: "Annie's Blue Ribbon General Store", "cutting fruit", "KidO toys"
Tags: "Annie's Blue Ribbon General Store", "S'Well Water Bottles", "Sadie Nash Leadership Project"
Annie’s Blue Ribbon General Store is proud to support the Sadie Nash Leadership Project for the second year in a row. 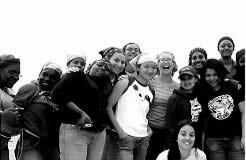 SNLP is a truly awesome Brooklyn-based organization working with young women from all over New York City to build leadership skills, foster empowerment, and develop youth-driven community projects. This year, we donated a Swell water bottle to their silent auction to be held on November 7th. Go Sadie Nash! Tags: "Annie's Blue Ribbon General Store", "Endless City NYC"
Loving this new set of NYC cityscape cards we just got in… you can create a million different pictures of our fair city by moving these two sided cards around (16 two sided cards packed in a beautiful box). Lovely & Entertaining. These wonderful cards are richly detailed illustrations by artist Mark Bischel, exposing the grace and grit of New York at dusk. Endless City NYC– $21.95. Tags: "Annie's Blue Ribbon General Store"
We love all our customers, local and international alike (sending package to Gaza now!). 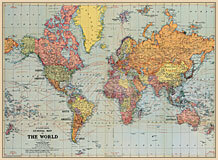 Unfortunately shipping internationally is an expensive and time-consuming task. We’d love to be able to fulfill every order, but for the holiday season we need to put a hiatus on international shipping to best serve our local and national customers. We’ll continue to take international orders until November 1st, and resume in the new year. For all our international customers out there–stock up this weekend!! Last call is Monday 10/31!!! Tags: "Annie's Blue Ribbon General Store", "Squirrel Pull Toy"
Oh my goodness, maybe it’s the fall weather, maybe it’s my new delicious daughter, maybe it’s the combo of all this cuteness, but I think this is the sweetest Pull Toy ever! Help pull this bushy tailed squirrel to a delicious acorn lunch. Pull the string to hear its happy squeak and watch the appreciation with its wagging tail and its sweet large-eyed expression. Squirrel Pull Toy– $22.50. Tags: "Annie's Blue Ribbon General Store", "Penguin Cocktail Shaker", "Penguin Ice Bucket"
How much fun is this Penguin Shaker? LOVE IT! Make the impending cold weather a little warmer by mixing some drinks with this wonderful Cocktail Shaker. 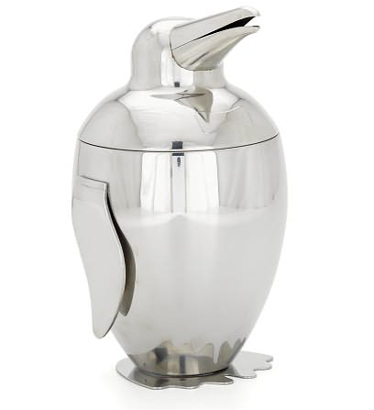 Pair it with its’ friend- the Penguin Ice Bucket (w/tongs) to take your Bar up a few notches. 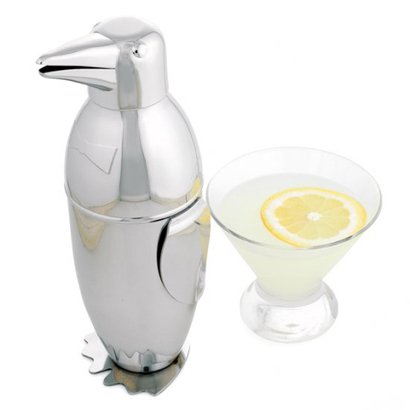 Penguin Cocktail Shaker– $55 and Penguin Ice Bucket– $72. 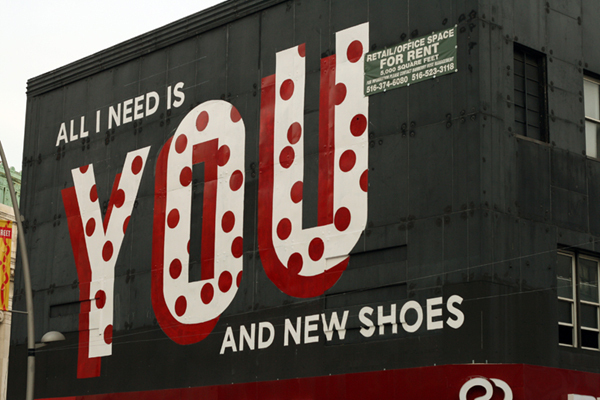 All I Need is You….And New Shoes…. Tags: "Annie's Blue Ribbon General Store", "Love Letter To Brooklyn", "Steve Powers"
If you’ve been in and around Downtown Brooklyn lately, you may have noticed (somewhat cryptic) messages on the old Macy’s parking garage and nearby. I first caught a glimpse of it as I was exiting our local grocery, Brooklyn Fare. If you look up as you exit the store you see the word “DOWNTOWN” almost perfectly framed between two buildings. It’s part of the phrase, “MEET ME DOWNTOWN FOR A FEW” painted on the garage at Hoyt and Livingston. 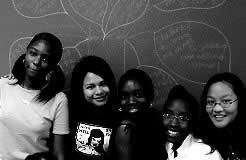 The works are by the artist Steve Powers (also known as ESCO) and are titled a “Love Letter to Brooklyn”. I saw the “ALL I NEED IS YOU” piece last night after closing up shop. It’s particularly amusing as the building is in fact a shoe store, one of many on the Fulton Mall. I love the way the statements work with the context of the neighborhood. In the 19th century the Fulton Mall (a stretch of Fulton which now includes over 200 stores and serves as a major transportation hub) was the major shopping district of Brooklyn. It included the department store Abraham & Strauss (now the location of Macy’s Brooklyn), Frederick Loeser & Co, and numerous dressmakers and tailors. As you walk around the neighborhood, the ghosts of these business’s advertisements remain on the sides of buildings. The area’s current retail tenants are largely discount stores, cell phone stores, and of course shoe stores. The “Love Letter To Brooklyn” to me, combines the nostalgia for the area’s history with the revitalization currently happening. Check it out when you’re in the neighborhood!